Of the four contractors awarded franchises in the original television licence round of 1954, Granada Television is the only one that remains to this day. Its founding father, the genial but often authoritarian Sidney Bernstein, was undoubtedly the dominant influence on the growth and development of commercial television in Britain. Granada Television was the crowning achievement of a many-faceted career that had included building up a successful cinema chain, using film in wartime propaganda, and producing features with Alfred Hitchcock . Born Sidney Lewis Bernstein in Ilford, Essex, on 30 January 1899, he grew up in an era when British music hall was flourishing, but cinema was still more a novelty than an established form of entertainment. His father, Alexander Bernstein , head of the large Orthodox Jewish family, already had several business ventures in operation when, in 1906, he added one which would condition his second son's life: he built a new music hall, the Edmonton Empire. By 1914, and the outbreak of the First World War, he had created a budding entertainments group, including a number of early cinemas (known then as 'flickers') and a film-renting business. As a young man in the 1920s, Bernstein gained experience in variety theatres in London, but he soon became involved in the rapidly expanding world of cinema. For him films would always be something more than a means of making money or even exercising a flair for showmanship. At 23, after the death of his father, he took command of the family chain of cinemas and, in 1925, he helped found the London-based Film Society with the object of bringing audiences a range of 'films of intrinsic merit' from abroad, which they would otherwise not have the chance to see. The Film Society was the first to show the films of Eisenstein , Pudovkin and René Clair in the UK, and attracted people such as H.G. Wells and George Bernard Shaw . However, the cinema chain was the real business, and in 1928 the Bernsteins (Sidney and younger brother Cecil ) merged with Gaumont-British in a deal shrewdly organised by Sidney, with himself as managing director. Just before his father's death in 1922, Sidney had paid a visit to America and a tour of their palatial new cinema houses encouraged him to start building an entirely new kind of cinema in England. These were of startling splendour, several of them designed by the Russian theatre director Theodore Komisarjevsky , whose tastes revelled in the ornate and the exotic. Bernstein's proud brand name of 'Granada' came from a fondly remembered tour of Spain, especially its architecture, and he opened his first purpose-built Granada cinema in Dover, Kent, in 1929 with the advent of 'talkies'. Sidney Bernstein's interests also included the theatre. He built the Phoenix Theatre in London's West End, which opened in September 1930 with the original production of Noël Coward's Private Lives, with a cast that included Coward himself, Gertrude Lawrence and Laurence Olivier . Bernstein was also one of the first supporters of the movement for a British National Theatre. As Granada became a major British cinema force - by 1935 a new Granada was being opened every three months - Bernstein earned a reputation for originality. He fought and won battles with local councils over Sunday cinema showings. He introduced the Granada questionnaire for cinema audiences - a first attempt to establish on a rational basis what the audience thought of the films they were being offered and what they wanted for the future. He also led the way with children's Saturday matinees, and throughout this period he developed strong links with the American film industry. On visits to Hollywood, he established long-surviving friendships with Charles Chaplin , Alfred Hitchcock , John Huston , William Wyler , Joseph Cotten , and many others. During the Second World War, Bernstein served as film adviser to the Ministry of Information , supporting a number of patriotic films - including Noël Coward's salute to the Royal Navy, In Which We Serve (co-d. David Lean, 1942). In 1944 he served under Eisenhower as Chief of the Film Section at the Supreme Headquarters Allied Expeditionary Forces (SHAEF) where he brought his friend Alfred Hitchcock over from Hollywood to make two French-language shorts as a tribute to the French Resistance ( Bon Voyage and Aventure Malgache , 1944). In 1945, he decided to produce a film based on footage taken by Allied cameramen of the German concentration camps and he invited Hitchcock to supervise it. The film (with the working title Memories of the Camps) was intended as a permanent reminder of Nazi atrocities for German and world audiences but it was buried in the vaults of the Imperial War Museum and screened for the first time on British television in 1985 as a part of the making-of documentary Evidence for All Mankind (ITV, tx. 8/9/1985). After the war he returned to Hollywood to work in partnership with Hitchcock (they formed the production company Transatlantic Pictures ) on the production of Rope (US, 1948) and Under Capricorn (1949). Unfortunately, they were two of Hitchcock's least successful films. When the Television Bill was passed by Parliament in 1954, creating the Independent Television Authority , Granada applied for and was granted the contract for providing programmes for the North of England. Although Bernstein was initially opposed to the concept of commercial television - fearing that the right to broadcast into millions of homes carried "such a great propaganda power that it could not be entrusted to any bodies other than a public corporation" - Granada rapidly became the most adventurous and respected of the early ITV companies, the longest surviving and, after a shaky start, the most consistently profitable. In its early days, Granada Television gained an unparalleled reputation for investigative journalism in programmes such as Searchlight (ITV, 1959-60) and World in Action (ITV, 1963-98). For Granada's innovative What the Papers Say (ITV, 1956-68, 1970-82; C4, 1982-89; BBC2, 1990- ), during a late 1950s run, Bernstein had insisted to distressed young producer Jeremy Isaacs that he persuade none other than Orson Welles to write and present the programme. The preposterous idea was not followed up. The vast possibilities of television drama and social documentary programmes were clear to Bernstein from the start and the idiosyncratic style of Granada TV's output in these fields during the early years came largely from the authority he exerted and the guidance he supplied. Keen that Granada Television should reflect the culture and talent of the region, he made a point of encouraging northern writers and artists. He succeeded well beyond his expectations with Coronation Street (ITV, 1960- ), which transcended its working-class Lancashire setting to become the nation's favourite TV series and the longest-running soap-drama. 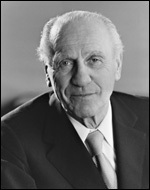 In 1969 Sidney Bernstein became Baron Bernstein of Leigh and, on reaching the age of 72, resigned the chairmanship of Granada Television while remaining chairman of the Granada Group until 1979. Ten years later he became President of the Granada Group. A man of immense vitality and a forceful personality which he stamped indubitably on Granada Television, Bernstein was awarded the BFI Fellowship for outstanding achievements in film and television in 1984. He died at the age of 94 in London on 5 February 1993.